3 years ago LINUS came to Last Hope from Hempstead Town Shelter as a young Lab mix with heartworm. Dr. Siegel at Hempstead Shelter completed his heartworm treatment. Then LINUS was adopted in Sept 2015 by a kind lady who loved him very much. His owner has come upon hard times and is now without a home. Tearfully she was forced by circumstances to bring LINUS back to Last Hope. 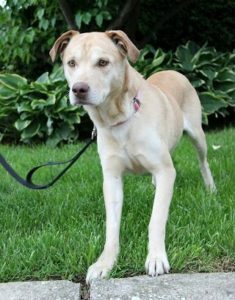 We promised to find LINUS a new home where he will again be loved & cherished. LINUS is b/w 4-5 yr old, weighs 72 lbs and could stand to lose a few. He is GOOD with kids and some other dogs on a case by case basis. Right now poor LINUS is depressed about being back in a shelter. This depresses us too. 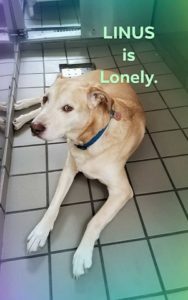 Help Last Hope make LINUS a happy Lab again.